I feel like I know my attorney and that she cares about me. I felt as though a trusted family member was helping me all the way to the completion of the Trust settlement. The whole experience was overwhelming but with all the friendly and professional help, I got through it to everyone’s satisfaction. With attorneys in Honolulu and on the Big Island, Okura & Associates serves clients on Oahu, Kauai, Maui, Molokai and the Big Island. 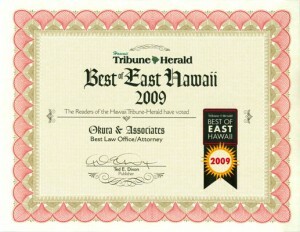 We were voted the Best Law Office on the Island of Hawaii in six separate years in the Readers’ Choice poll of the island’s largest daily newspaper. Specializing in Estate Planning, Elder Law and Probate, we are gaining a statewide reputation for our expertise in protecting assets from nursing home costs.